Yamaha improves its adventure-tourer, but is it enough? 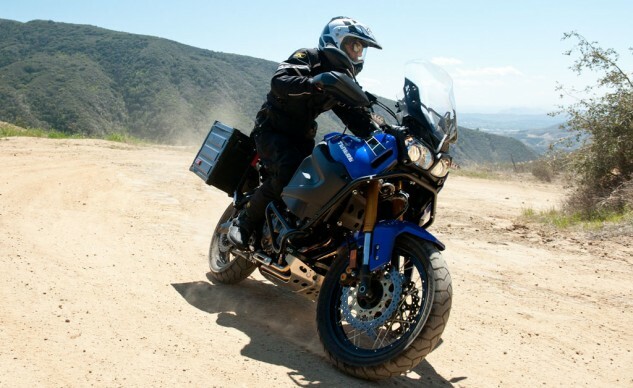 Yamaha‘s Super Ténéré barged into the big-bore adventure-touring market in 2012, gunning for the A-T juggernaut that is BMW‘s R1200GS. Its 1199cc parallel-Twin motor was a good match for BMW’s air/oil-cooled GS, using a unique 270-degree crank-pin offset to deliver traction-enhancing output in the dirt. 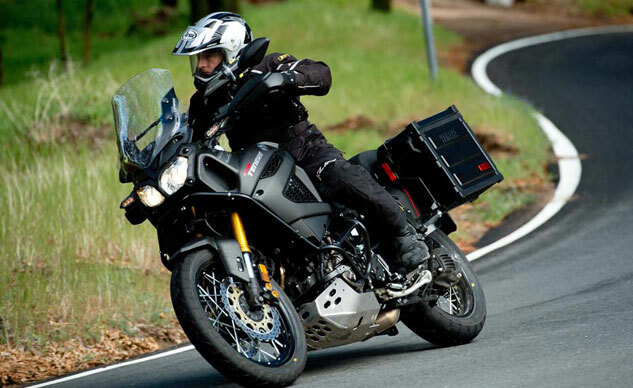 The Super Ten’s off-road capability was on par with the GS, and its on-road comfort was far superior to KTM’s dirt-focused 990 Adventure. But then the goal posts moved, first with the introduction of the wonderfully balanced liquid-cooled R1200GS and then with the debut of KTM‘s fabulously fast 1190 Adventure. The bright lights from the Euro bikes cast a big shadow. But upgrades to the 2014 edition of the Ténéré aim to bring the spotlight back to team Yamaha, with an emphasis on rider comfort, improved wind protection, updated instrumentation and standard cruise control, plus a host of other minor tweaks including a new cylinder head. Tidy LED turn signals are a visual clue you’re looking at the new 2014 edition. At the top of the Ténéré line is a new ES version that allows a rider to adjust the bike’s suspension at the push of a few buttons, a system quite similar to the FJR1300ES we recently tested. The ES will cost $1,100 more than the standard version ($15,090) and includes heated grips. 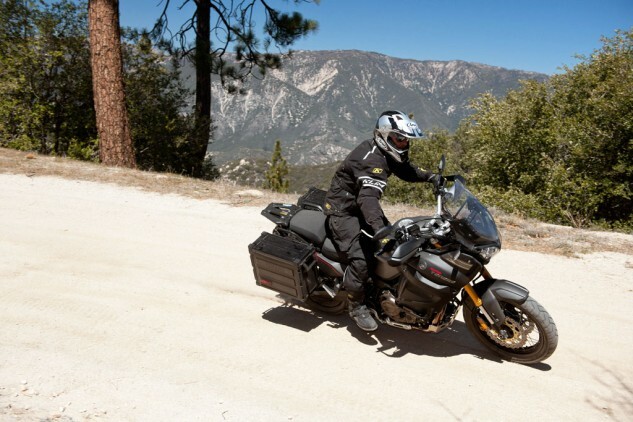 The first part of our two-day ride was spent on the highway while getting to the San Bernardino Mountains, where the Super Ten made positive impressions. Electronic suspension adjustability comes to the Super Ténéré in its ES version, available only in this tough Matte Gray/Matte Black colorway. The Ténéré’s handlebar mounts are 10mm higher, but a new tapered aluminum handlebar (formerly steel) keeps the same effective height. The new bars are 10mm closer to the rider and are now rubber mounted to isolate vibration. Dual counterbalancers and an overdriven sixth gear also keep engine vibes from bothering the rider. 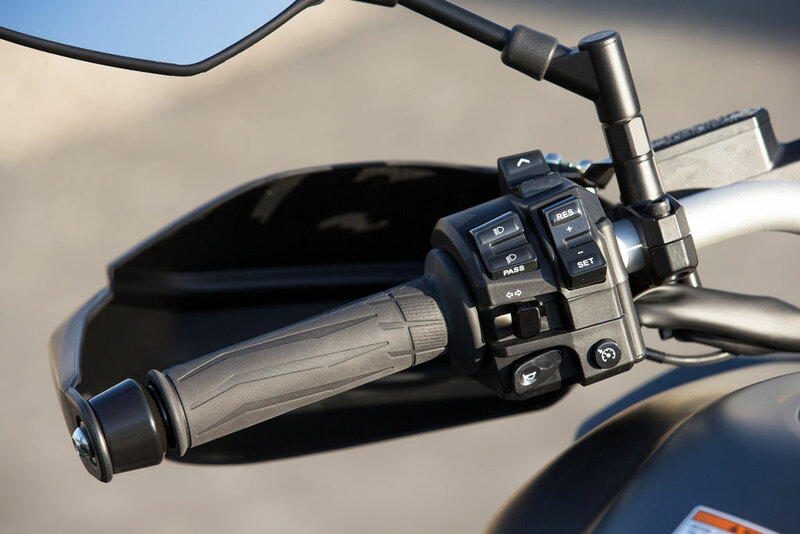 Additionally, the new cruise-control system makes highway travel serene, locking firmly onto any speed and allowing 1-mph speed increments at the touch of a button – a pleasing feature on any motorcycle intended for long distances. However, the Super Ten’s most impressive upgrade is its wind protection. The old windscreen created turbulence for some riders, but this new one (40mm wider, 15mm taller) is much improved. Nylon winglets at the base of the shield and new deflectors below the headlights help smooth airflow reaching the rider. The new windshield can now be adjusted to its four positions without tools, but its mechanism (loosening two nylon knobs) is too finicky to adjust while in motion. Standard-equipment hand guards shelter fingers from the brunt of the wind. On the climb up to Big Bear, we diverted off the highway and onto a dirt road that steeply ascended the mountain. The Ténéré once again proved its off-road chops, rolling confidently on the rutted and rocky terrain. While the Super Ten isn’t as agile as the GS and KTM, it’s impressively sure-footed. A sand-filled rut in a corner surprised me and threatened to tuck the front end, but it recovered nicely with throttle application. Lesser adventure bikes would’ve ended up on the ground. Scaling in at 575 pounds, the Super Ténéré makes for a lardy dirtbike but a capable adventure-tourer. Suspension travel of 7.5 inches at both ends strikes a good balance of off-roadability and street composure with a relatively modest 33.3-inch seat height. The seat can be raised an inch by repositioning a rubber base plate. In this low-speed environment, I preferred using the softer D-mode (“Tour”) setting and switching off the traction control, as the grunty engine did a great job of hooking up on the loose terrain with old-school throttle control. It would pull cleanly from just above idle speed. Later, I tried the Sport setting but didn’t like the abruptness in either throttle direction. There are two traction-control settings (plus off). The least-intrusive position allows some tire-spinning slides but reigns things in before getting too slideways. Back on the tarmac, the long-legged Ténéré proves to be a competent sport-tourer. An aggressive push on its wide handlebar overcomes conservative steering geometry, and once leaned over, it’s stable and confidence-inspiring. Pegs will drag eventually, but that only happens at a brisk pace that’s beyond the comfort zone of most riders. The non-dirty little secret of adventure-tourers is that they make for surprisingly competent sport-tourers. Brakes are unchanged for 2014, but the Super Ten’s binders didn’t really need any. Lever pressure is firm and predictable, allowing a rider to confidently threshold brake. Standard ABS bails you out if your hand gets too greedy and doesn’t intervene prematurely. Improvements from a new cylinder head and D-mode tuning are mostly unnoticed. Intake ports are now more direct and slightly smaller for a higher-velocity flow, and the exhaust ports change from a D shape to a round one. Valve spring pressure is reduced by a purported 30%, and new piston rings have reduced tension. New headers do without the previous version’s crossover tube. In addition, the clutch damper is now rubber, reducing noise and vibration from the previous spring type. Note the beefy skidplate that protects vulnerable header pipes. Saddlebags are an extra-cost accessory. The next day dawned with a blanket of snow around our Lake Arrowhead hotel. I was glad to start the day aboard the ES model, enjoying the heat thrown off from its heated grips. I began with the ES’ suspension preload set to its rider/luggage position. Suspension damping can be set to three positions (Hard, Standard or Soft), and each has seven levels of fine-turning adjustment for further customization. When set to Standard, the Tenere ES felt similar to the factory settings from the base model Ténéré. Almost everything in this photo is new for 2014, including the windscreen, instruments, aluminum handlebar and electronic suspension fork caps. Wet and cold roads called out for electronic rider aids, so I chose the Touring D-mode and the most intrusive traction-control setting. Yes, an experienced rider might not need these nannies, but they are a comforting safety net in challenging conditions. Yamaha’s lawyers wouldn’t allow ABS to be switched off, so riders who want to defeat it have to resort to spinning the rear wheel on its centerstand in second gear. 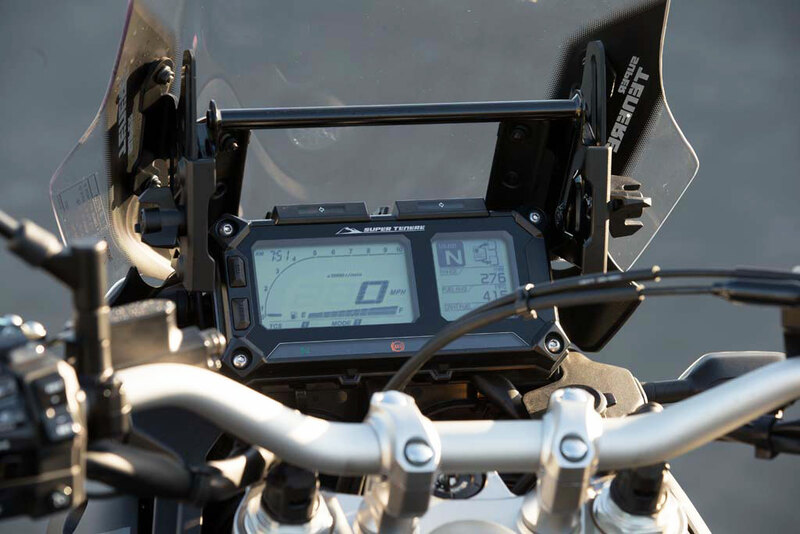 And speaking of electronics, props to Yamaha for equipping the Ténéré with a comprehensive set of LCD instruments. They display pretty much everything you could hope for, including a trip computer, gear position, air temperature, a large digital speedometer and, on the ES, heated grip and suspension settings. The fuel-economy readout never dipped below 40 mpg, even when ridden hard, so it’s reasonable to expect 250 miles or more from each fill of its 6.1-gallon tank. The right side of this switchgear directs a plethora of electronics, including two up/down toggles for cruise control and menu navigation. As the roads dried and temperatures rose, the pace began to hot up again. It was pleasingly delightful to simply punch a few buttons to firm up damping rates instead of pulling out a screwdriver. On the freeway drone back into town, I enjoyed a plush ride by selecting the Soft damping mode while seated. 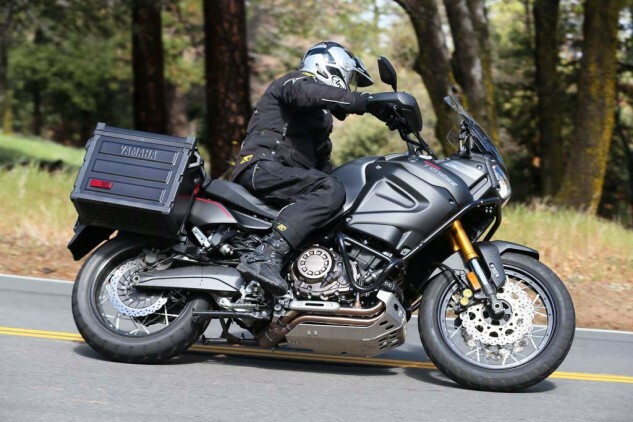 The Super Ténéré continues where it left off, but it expands on its versatility by improving rider comfort and, particularly, its wind protection. While it’s still outgunned in the engine department, it’s by no means slow. 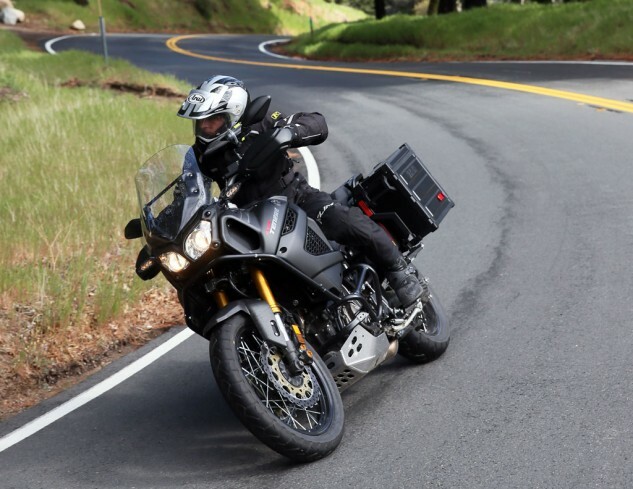 Horsepower addicts will want to look elsewhere, but for adventure riders who want a superbly competent steed that can ably tackle everything from a dirt trail to a twisty canyon road to super-slabbing across state lines, the Super Ténéré feels comfortable doing all of them. You’ll want to stay away from double jumps, but the Super Ten performs better than average off the pavement. Overall, it’s do-it-all competence impresses but stops short of being class-leading. 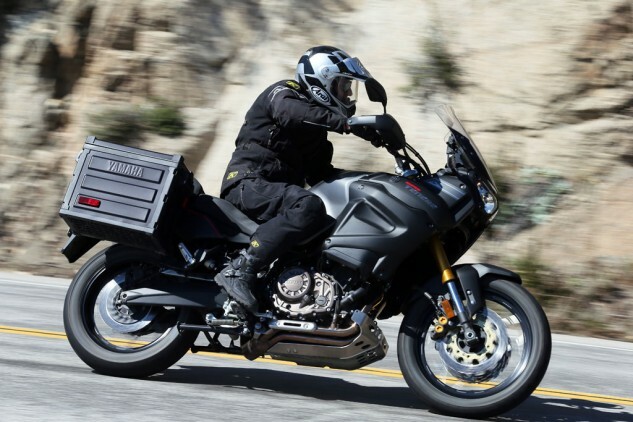 The ES model is, naturally, the most desirable iteration, and while its $16,190 MSRP ain’t cheap, it undercuts a similarly equipped R1200GS by $2,150. That adds up to about 500 gallons of fuel, which computes to about 20,000 miles of free travel. Seen in this light, and with 24,000-mile valve-adjustment intervals, Yamaha’s Super Ténéré looks like a fairly strong value proposition.